Milk kefir is like the pin-up kid of probiotic foods. It may contain up to 30 strains of beneficial bacteria (including the much studied L. rhamnonsus), and a similar number of yeasts, and has been shown to possess anti-inflammatory, antibacterial, antifungal and antitumoural properties. It also contains B vitamins, vitamin K2, calcium, magnesium, phosphorus, beneficial acids and enzymes, and more in an easily assimilable form. And it’s as easy as adding the starter culture, kefir ‘grains’ (or more technically, symbiotic colonies of bacteria and yeasts), to milk. Note: This is only a suggested quantity to get you going. If you want to make 2 litres of kefir at a time, go for it! Pop milk kefir grains into a jar and top up with milk. Don’t fill past the shoulder of the jar or you may find it bubbling over during fermentation. Screw the lid on loosely to allow carbon dioxide to escape. You can cover the mouth of the jar with cloth, but sealing the jar favours the anaerobic bacteria in the culture and helps prevent oxidation of the milk (a jar with an airlock is ideal). Set the jar in a dark spot (out of UV light) until the milk has thickened to a yoghurt-like consistency, approximately 12-48 hours. The time it takes to culture depends on the ratio of kefir grains to milk, as well as the temperature. I recommend room temperature for the best consistency and flavour, but you can leave it somewhere warm if you want to speed things up. Note: if you find the whey (a white/yellow liquid) is separating from the milk solids, this indicates you are fermenting for too long. The kefir is still safe to consume, but it may taste quite strong (and your poor grains can get a bit stressed). Remove kefir grains by scooping them off the top of the set kefir or by passing the kefir through a sieve (some recommend against using metal utensils, but I haven’t noticed any ill-effects on my grains from brief contact with metal). Place the grains in a clean jar to begin the process again (some recommend rinsing them with water, again, I disagree. This is not done traditionally, and may damage them). The grains grow and multiply over time, so you’ll soon have enough to share with family, friends, and folks at the bus stop. Or you could just enjoy them as something akin to sour gummy bears(!). For an extensive discussion of these cauliflower-like ‘grains’, refer to Dom‘s informative site. Kefir can be consumed immediately after the grains have been removed. However, there are several benefits to letting it ferment for a second time without the grains. Nutrient levels, particularly of the B vitamins, increase substantially. Lactose content is further reduced. And surprisingly perhaps, the kefir will become less sour. Adding some fresh milk at the beginning of the second ferment will also reduce the tang of the final product (although the lactose content will be higher in this case). 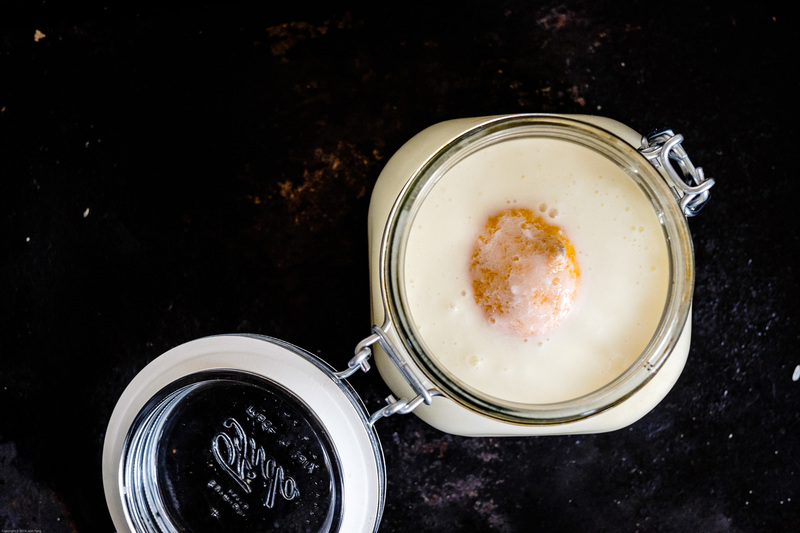 After the addition of optional flavourings such as lemon rind, fruit and spices, reseal the jar,* move to a dark spot, and leave for another 6-12 hours or to your preference – the longer you leave it, the more runny the kefir will become. If the whey separates at this stage simply stir it in again. Consume immediately or store in the refrigerator. Best within a few days. * Note: Carbon dioxide produced during fermentation can make the final product slightly effervescent. If you would prefer to avoid this, simply remove the lid for the second ferment, and instead cover the mouth of the jar with a cloth. This will also reduce the likelihood of alcohol being produced by the yeasts, though the level is generally not more than 1% in a sealed jar. If you wish to take a break from making milk kefir, simply place kefir grains in a jar, cover them with milk and leave them in the fridge. They may be stored this way for a couple of weeks or more, but transferring them to fresh milk weekly keeps them happiest. Kefir grains may also be frozen or dehydrated, but they may be less robust later on. Bottom line, kefir grains are pretty resilient – if they are culturing your milk, they are still alive! Milk kefir is an acquired taste – it is quite tart and a little yeasty (think B vitamins!). It’s also quite potent, and can trigger detox reactions such as headaches. I suggest starting with a tablespoons or so mixed into yoghurt or another food, particularly if you don’t consume probiotic foods on a regular basis. Or you could add some honey or fresh fruit to sweeten plain kefir. If you prefer a thicker yoghurt, try chilling the kefir in the fridge first, or straining it through a cloth. Smoothies are an easy way to up your consumption of kefir. Or blend it with a frozen banana to create a frozen yoghurt treat. Kefir also makes beautiful labneh (yoghurt cheese) and other savory dressings and dips. 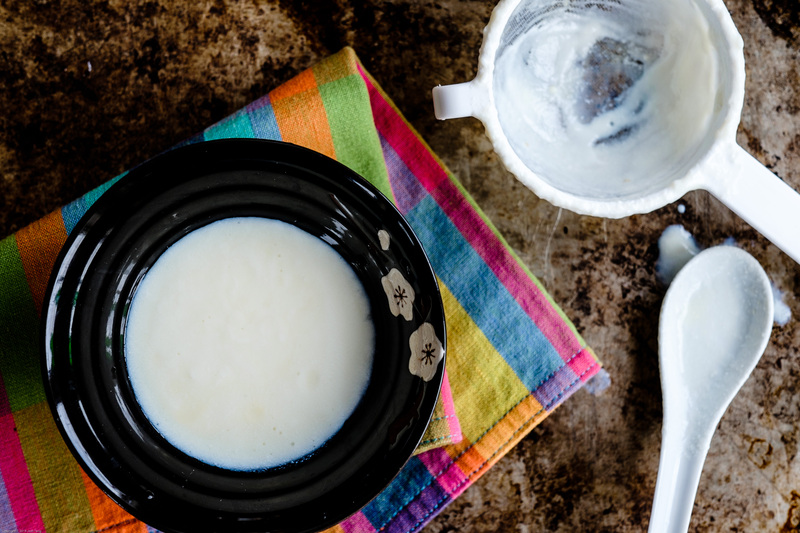 You can substitute milk kefir for yoghurt and buttermilk in baking (although its probiotic benefits will be lost). For further inspiration, check out my Pinterest page.